The problem of the expected density of a saturated random packing of unit circles in the plane can be described as follows. In a circular region $C$ of a large radius pick a point at random and draw a unit circle centered at the chosen point. Then pick another point in $C$ at random and draw again a unit circle, centered at the chosen point. If this circle overlaps with the previously drawn one, discard it and pick another point in $C$. Continue this process until the probability of finding one more point in $C$ for which the unit circle drawn about it does not overlap with any of the previously drawn circles is zero. 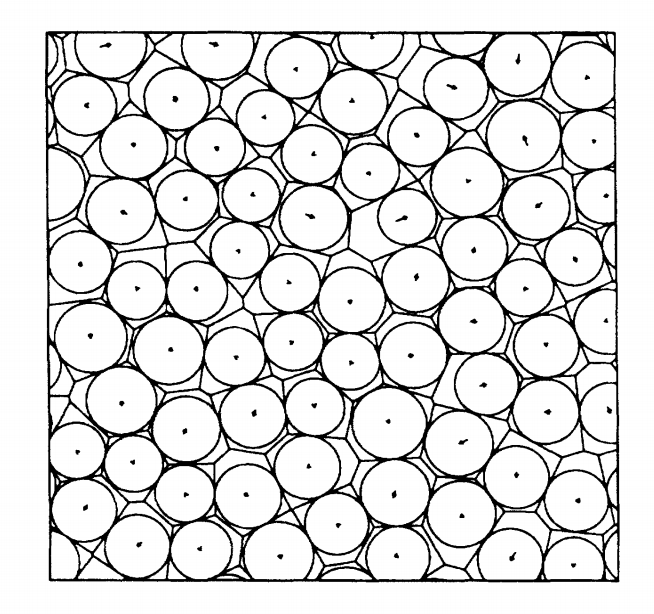 The density of such packing of unit circles in $C$ is computed as the sum of the areas of the unit circles divided by the area of $C$. Let $d(C)$ denote the expected value of the density, and let $d$ denote the limit of $d(C)$ as the radius of $C$ tends to infinity. Numerical experiments indicate that $d$ should be around $0.82$ (see for example https://www.sciencedirect.com/science/article/pii/0021979771903389), but, to the best of my knowledge, the exact value of $d$ is unknown. Are there any rigorous results obtained in this direction? Any reasonably good estimates, perhaps? Any references will be appreciated. This 2001 paper of Penrose and 2002 paper of Penrose and Yukich show that the limiting density $d$ actually exists (not just in 2 dimensions); however I could not immediately see if their theorems lead to any explicit bounds on $d$. This 1997 paper of Caser and Hilhorst give series expansions which lead to rigorous lower bounds for $d$; it seems the best they can do in the case you're interested in was $d>0.328$ (see Eq. 3.21). (My answer that I linked in the comments above gives links to reviews in the physics literature which contain some discussion of estimates of $d$; I'll just reproduce the estimate $d\approx0.5472\pm0.002$ according to simulations described here). Fig.2: The first iteration step. Not the answer you're looking for? Browse other questions tagged discrete-geometry geometric-probability packing-and-covering circle-packing or ask your own question. Is there an “accepted” jamming limit for hard spheres placed in the unit cube by random sequential adsorption?